Heading into the 2010 season, there was a great deal of uncertainty for the Oklahoma Sooners. 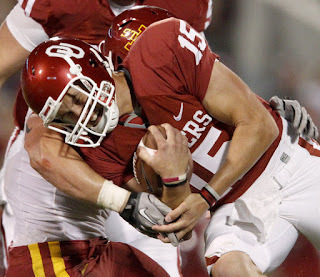 A year earlier, an injury to vaunted quarterback Sam Bradford forced redshirt freshman Landry Jones onto the field much earlier than expected. Oklahoma struggled to manage a disappointing 8-5 record. The Sooners needed to lean on that principle early on. The team narrowly avoided a major upset against Utah State in the season opener and barely defeated non-conference opponents Air Force and Cincinnati in the third and fourth games. Then, after a 6-0 start, Oklahoma lost two of its next three in road contests against Missouri and Texas A&M. But with that challenging Bible-based concept readily within arm’s length, the team continued to work through injuries and tough opponents in an effort to achieve its goals. Even though Jones was a third-year sophomore and second-year starter, he had already earned his teammates’ respect as a spiritual leader. The wristbands weren’t the first time he had used the Bible to inspire others. In fact, Jones held a Bible study on the book of Romans in the Oklahoma locker room during the previous summer. Oklahoma finished the season on a tear. The Sooners won its final five games (including the Big 12 Championship Game and the Fiesta Bowl) and finished the season 12-2 and ranked #6 in the national polls. Over the next two years, Jones led the program to an overall 20-5 record and finished his career as the third leading passer in NCAA history. Now playing in the NFL for the Pittsburgh Steelers, Jones eventually wants to share his love for the Bible in a more traditional setting. Dear Lord, we thank You for the tough times knowing that they work to make us better people. Helps us to continue to work hard to improve who we are. In the Name of Jesus, Amen.